Vanguard Realty announced today it will be hosting a live music event in association with First Light Brookline, an annual neighborhood holiday celebration. 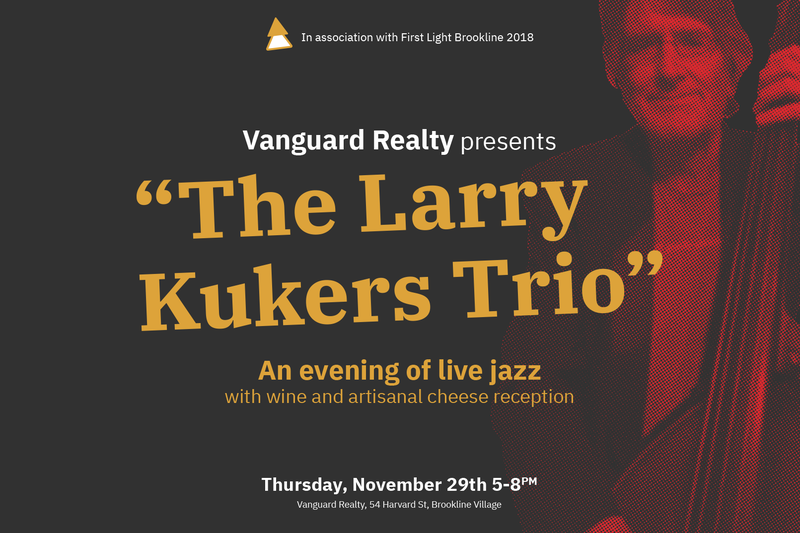 The Brookline Village real estate brokerage is presenting The Larry Kukers Trio, a live jazz performance with wine and artisanal cheese reception at their offices at 54 Harvard St. The celebration will be held from 5-8 pm on Thursday, November 29th, in conjunction with other First Light festivities. Bassist Larry Kukers has for decades been one of Boston’s most unique and creative musicians. Thursday’s performance will include Berklee College of Music jazz faculty members on piano and drums. The event is free and open to the public. Come join the fun!